Ohio-based Akron Diamond had an answer to Coleman's Quick-lite series, and that was in the form of utility lamps, such as these two 121Gs. Both have original shades - the one on the left is an Avocado shade of sorts, and the one on the right is an "opal white" shade. Equipped with dual burners that produced 300cp and available in other colors, they were a formidable rival to Coleman - at first. Coleman being favored during World War II put Akron in a bind, and they went out of business in 1948. This lamp has "Akron" etched into its filler cap, which leads us to believe it was made by them. We, however, have been unable to find a match, so give us a shout if you know anything! This large ceramic pot lamp was made by Akron to be sold at Montgomery Ward during the Great Depression for $7.45. The shade is not original - the original parchment shade has since disintegrated. The metal found encased by the pottery holds about 1.5 pints of gas. Akron also sold this basic lamp through Montgomery Ward department stores. Although its sister has a built-in pump and instant-lite capabilities, this one has neither. It is a basic function lamp for its time and thus could be sold affordably. The Cremax shade is likely original. This bizarre-looking lamp was made by Aladdin in 1942. It is also bizarre in that it has no filler cap, which is unique to its time; during World War II, domestic use of metals was precious since so much had to be used for tanks, carriers, jeeps, and planes. Hence, the use of glass in manufacture of lamps such as this increased heavily and the use of metal decreased. The shade, an AGM windmill-style shade, is also glass. Put the Rickrolling aside, this is a different Astley. This torch-lighting lamp was actually made by Allen-Sparks circa 1919. This lamp may have also been made in bronze, and likely came with a parchment shade as opposed to the Akron Diamond one it is equipped with now. American Gas Machine made several lamps over their time in business, yet this is the only one in our collection. The Ready-Lite series was AGM's answer to Coleman's success with Quick-Lite lamps. Lamp 256A was essentially a recolor of the original 256 - this is jet black with forest green speckles; the pump is also somewhat different. The shade equipped as well as the glass beads attached to it are original and are quite valuable. This torch-lit lamp was manufactured by the Kansas City-based Economy Lamp Co. in the late 1910s. Note the unusual burner underneath the shade, which is not original. The tip cleaner is vertical and the air intake is horizontal. Another unusual note is "Pat Apld For" is embossed on the intake tube, which you can see here. The Edward Miller Lamp Co. of Connecticut made this Meteor Lamp before they were acquired by Coleman some time after Miller's 1909 death. Patented in 1900, this lamp may have run on kerosene oil and does not have a shade. Sporting dual mantles despite its compact size, this Gloria table lamp was sold by Canton, OH-based Best Light. Manufactured in the 1910s, the lamp used steel to make a sturdy base. Equipped is a Gloria shade original to this lamp. Gloria made this lamp and sold it themselves. Details are sketchy, but it appears the shade is original for this lamp. This lamp was likely made in the 1910s or 1920s, when Gloria was most active. Note the bottom bell on the fount, which makes it twice as high. Justrite Manufacturing of Chicago made two versions of this lamp; the other version lacks the built-in pump shown on the side of the fount of this one and the tank in the centrifuge, which functions as an air chamber. The pump features a plumbum (lead) check valve as opposed to standard rubber. The shade on this lamp is most likely a NuLite. New York City-based A.G. Kaufman made a series of table lamps with decorative designs. Included is an original shade; it appears this lamp may be kerosene fueled. Leacock Coleman is a separate but connected company to Coleman in Wichita and is currently active. They manufacture lamps using Coleman-style burners for the Amish market in Pennsylvania, for those that refuse to use electricity in their homes. This lamp has a Quick-Lite burner similar to those in the 1920s. Leacock Coleman also makes this wall lamp for the Amish community using the same Quick-Lite technology. Like the table lamp, the fount and handle are stainless steel. The parchment shade is original and still in its original wrapping. Lindemann & Hoverson of Milwaukee made this one-mantle lamp, which is very unusual. Neil McRae believes this is a version of their model 316, since its black crackle finish is the only major difference, and Neil and Terry Marsh both say it is instant-lighting. The generator has been replaced with a Coleman equivalent, but the shade holder is missing so the lamp remains shadeless. Lindemann & Hoverson also made the two-mantle 330A, shown to the left. Note the three items embedded into the fount - the filler cap, the pump, and a carburetor valve much like the ones AGM pioneered. This brushed gold lamp was likely sold during the Depression years. The shade appears to be original. The small lamp in the middle is worth more than the two large ones combined. It's a rare piano lamp of unknown origin used for illuminating the notes a pianist plays. The tank appears to be Coleman, but the burner and top are NuLite - the two larger lamps are to be used as donors to restore the piano lamp to a superior condition. According to Terry Marsh, this is a NuLite lamp. Note the little triangular burner apparatus, an automatic tip cleaner - Terry says that was something only done by National Stamping & Electric Works, the parent of NuLite. It appears to be a Model 110. It is unknown if this valuable hand-painted pretzel shade originally came with the lamp, but it appears to have been made for NuLite. This twin-mantle NuLite lacks the automatic tip cleaner apparatus. It appears to be match-lighting as opposed to torch-lighting, which may mean it is one version of their 110M. Despite the Akron Diamond Peacock shade, this lamp appears to be a NuLite similar to those exported overseas. It is a two-mantle lamp with a different burner style. This lamp is shrouded in mystery. Terry confirms that the burner is a NuLite, but is unsure about the copper tank. We believe that the tank is an Aladdin, as the shade seems to be an Aladdin. Further information would be appreciated! Chicago-based Pitner made this unique parlor lamp, which has a hinged air tube to allow the user to control the air flow when the lamp is off. At a whopping twenty-eight inches tall, this lamp's fount is nickel-plated copper and is torch-lighting. The shade appears to be original for this lamp. Radiolite of Milwaukee made this torch-lighting kerosene lamp around 1917, apparently in conjunction with a company called Ulfers based in Freeport, IL. This one-mantle lamp's burner is united with two horizontal air intake tubes, and is covered by an original shade. This lamp was made by the Sunshine Lamp company in Kansas City. Sunshine would eventually become a Coleman subsidiary. The equipped shade is original. Dayton, OH-based Thomas specialized in making kerosene items, which all could use the same external pump. In addition to this twin-mantle M1001 Kerosafe table lamp, they made an iron and a lantern which both ran on kerosene; they also made the M1007 lamp, pictured here with is brethren. The shades for both lamps are original. This British gem is the Tilley 1570. It is a very diminutive lamp that comes with its original shade and beads. This Tilley bracket lamp is in the WL series, which denotes "Wall Lamp," but was nicknamed the "Hospital Lamp" by the British Army due to its use in field hospitals during World War II. This lamp could be mounted to a wall, hung from the ceiling through its upper loop, or carried like a lantern by its wood handle. The robin egg blue is not the lamp's original colour, which was a blue-grey likely indicative of use in the Royal Air Force during the war. 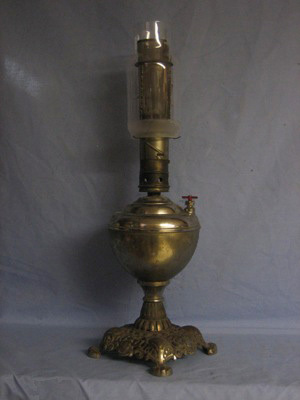 This lamp has been exchanged by many collectors and still lights, though its pressure indicator is no longer there. Tilley also made floodlights and searchlights for industrial use, such as this FL5 (Rd No. 762129) from 1935. This one has a single air tube, but Tilley later redesigned the unit to have two. Floodlights such as this were most commonly marketed to railways, but emergency services and road construction crews would also use these as searchlights given their enormous size. Tures Co. in Milwaukee made this arc lamp sometime before 1910. The origin of the glass globe is as of this time unknown. The Unknown Lamp Co. (who am I kidding?) made this oil lamp, which was used by women to heat old-style curling irons before the modern advancements of technology. This gas household lamp by Zeidler was bought at an auction in Fond du Lac, WI, that apparently contained several possessions of the Ringling Bros. It is unknown if this lamp and the one it was purchased with were at one time owned by the circus entrepreneurs, but it seems highly likely that it was. Special Thanks to Neil McRae and Terry Marsh for providing information for us!